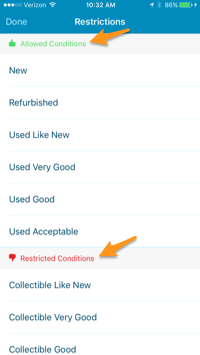 If you have the feature turned off in Settings, and have signed into your Seller Central account, tapping the Restrictions button will show you what conditions you are allowed to sell the product in as well as what conditions you are restricted from selling it in. This information will allow you to avoid listing and shipping items that will inevitably end up stranded inside of your seller account. *You will not see the Restrictions button for a product if you looked the product up again on the Search History screen.